One of the oddest foods I’ve ever seen was a frozen vegan product designed to look and taste like salmon, complete with a headless-fish shape and scaly “skin.” It contained a laundry list of hard to pronounce ingredients, and made me realize that just because something was vegan truly didn’t mean that it was healthy. Being the type of person who gets more excited over side dishes than traditional main courses (case in point: I ordered pasta with a side of mashed potatoes at a nice restaurant when I was 10, to my family’s chagrin), I can’t imagine missing fish enough to eat the aforementioned Franken-soy product, or fowl enough to indulge in Tofurky. Similarly, I think that veggie burgers should stop trying to taste like beef, and that if you miss them that much, perhaps your body is begging you to indulge in a real (grass-fed, organic) burger for a good reason. If you are currently or have ever been vegetarian, I don’t need to tell you that many veggie burgers are godawful. Unless you find one out at a good vegetarian restaurant, you are usually facing a pasty, brown hocky puck of a thing, sometimes deep fried to compensate for insipid flavor and flaccid texture. Putting the bready thing into a bun often seems redundant. I based this formula loosely on a recipe from The Kitchn that was in turn inspired by a well-loved burger from Ohio’s Northstar Cafe. I used quinoa in place of the brown rice, and chickpeas instead of the black beans, just because I liked the idea of those ingredients all hanging out together with sauteed beets. A small amount of egg and quick oats gently bind the burgers as they sear in the pan, and they get a bright flavor boost from lemon zest and juice and fresh parsley. They’re moist and delicate enough that sandwiching one between a Honey Oat Beer Bun doesn’t seem terribly like a big starch fest (not that I would mind one of those, clearly). 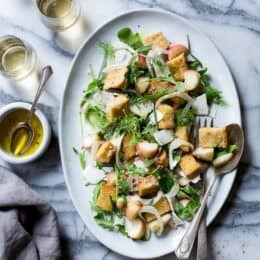 Though they benefit from a generous slathering of mustard, mayo, avocado, red onion and sprouts, they would also work well served as croquettes with a dollop of minted yogurt, or cooked into felafel-sized patties and nestled in a warm pita pocket with lemon tahini dressing and shredded romaine. 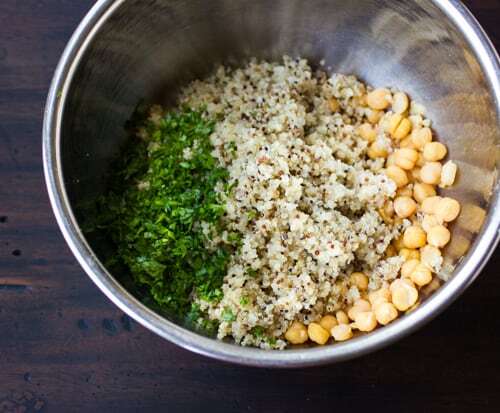 You do need to cook chickpeas, quinoa, and the vegetables separately, but these components can all be made ahead (and you can use canned beans in a pinch). The burger mixture itself keeps well in the fridge, affording you burgers for days. My favorite thing about these burgers is that although they look like rare beef, they actually taste like vegetables. If you don’t have 8 hours to soak your beans, you can cover them in boiling water and let them sit for 1-2 hours, or just cook them from dried; they will take a bit longer to cook. I like to cook my own beans, as directed below, but you can certainly use canned or jarred ones if your prefer. The half cup of dried beans that I cooked yielded 1 1/4 cups of cooked beans, but you can throw the whole can in, which should contain about 1 1/2 cups. In that case, you won’t need the bay leaf. As I mention above, the quinoa, chickpeas and vegetables can all be cooked a day or two ahead of time. The burger mixture keeps well for several days in the fridge for on-demand burgers. Serve these with Honey Oat Beer Buns. Update 11/13/13: A few commenters have reported that their burgers aren’t holding together well. Until I can get to the bottom of this, I would recommend weighing your beets – they should be 10 ounces in all. 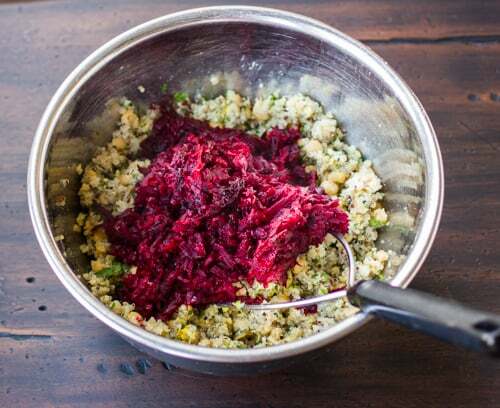 If you’ve weighed your beets and the mixture still won’t stick, try adding an extra egg and/or more quick oats. Drain the soaked chickpeas and place them in a medium saucepan with the bay leaf. Cover with 3 inches of water, bring to a boil, then reduce the heat and simmer, partially covered, until the beans are almost tender. At this point, add 1/2 teaspoon of salt to the pot. Continue cooking until the beans are very tender. This can take anywhere from 30 minutes to over an hour total, depending on the size and age of the beans. Add water to the pan as needed. When the beans are done, let them cool in their water until needed. If you like, you can slip the loose skins off the beans, though this isn’t necessary. 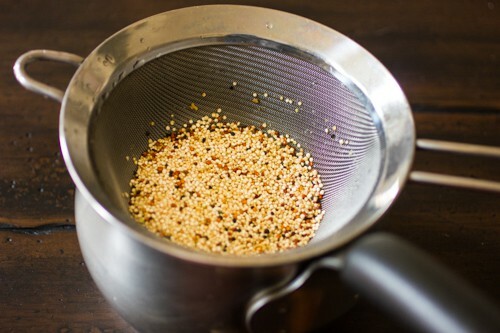 Place the quinoa in a very fine mesh strainer, place the strainer in a bowl or measuring cup, and fill with water to cover the quinoa. Let soak 5-10 minutes, swishing occasionally, to rinse off the bitter coating. The water will turn a beige-yellow. Drain the quinoa well, discard the soaking water, and place the quinoa in a small saucepan with 1 cup of water and 1/4 teaspoon salt. Bring the mixture to a boil, immediately reduce the heat to very low, cover the pot, and let the quinoa steam until tender and all the water is absorbed, 15-20 minutes. Remove from the heat and let sit, covered, until ready to use. 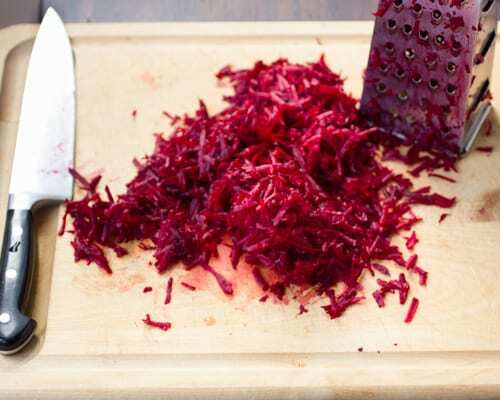 Peel the beets with a potato peeler, then grate them on the large holes of a box grater. The beets will spray, so wear an apron and have your work area clear of things you don’t want covered in tiny red specks. Heat the oil in a wide saute pan (that has a lid that you will use later) over medium heat. When it shimmers, add the onion and cook, stirring occasionally, until tender, 5-10 minutes. Add the garlic, the grated beets, and a big pinch of salt. Give it a stir, then cover the pan and let the mixture cook, stirring occasionally, until the beet is tender, 5 minutes or so. Remove from the heat and deglaze by adding the vinegar and stirring up any good stuff that is stuck to the bottom of the pan. In a large bowl, combine the cooked chickpeas, quinoa and beet mixture and mash with a potato masher to break up the beans slightly – the mixture should still be fairly chunky. Stir in the parsley, lemon zest and juice, egg, oats, and 1/4 teaspoon salt until combined. 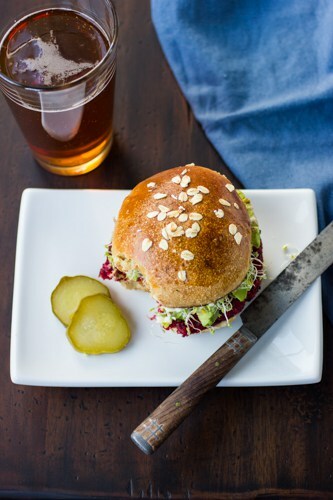 Serve the burgers on toasted buns slathered in any toppings you like. Hi Alana, this looks like yet another winner. I'm going to make some tonight! I will admit to occasionally partaking in fake meats of the porcine variety…after all, when you haven't had pork since adolescence, the beauty of sausage is in the spice. Agree on the veggie burgers, and if I never see another portabello "burger" I won't miss a thing. These are gorgeous. Totally- no judgement! I love a good portabello "burger" too. 1. 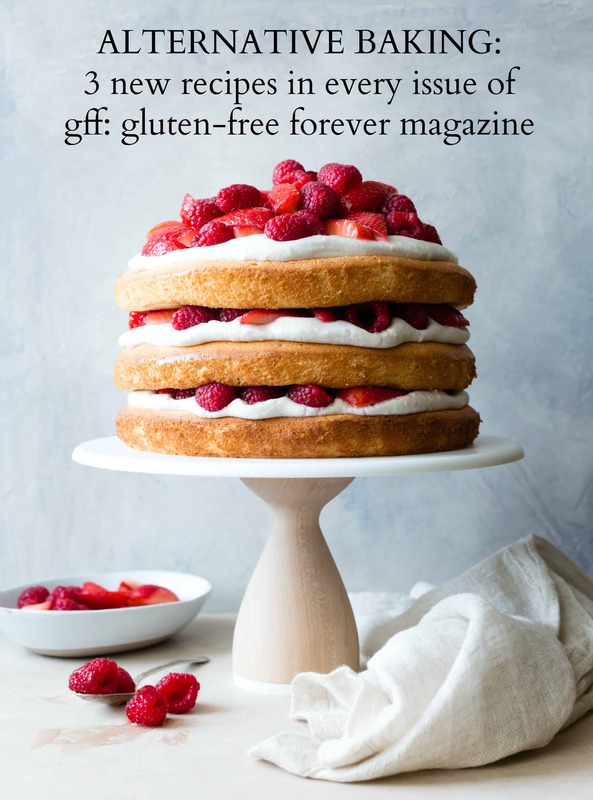 I pretty much never comment on blogs but I just have to say that you have the most wonderful gift for making the most amazing-looking meals out of ingredients that usually bore me or give me the heebie-jeebies. 2. I love you approach to food! 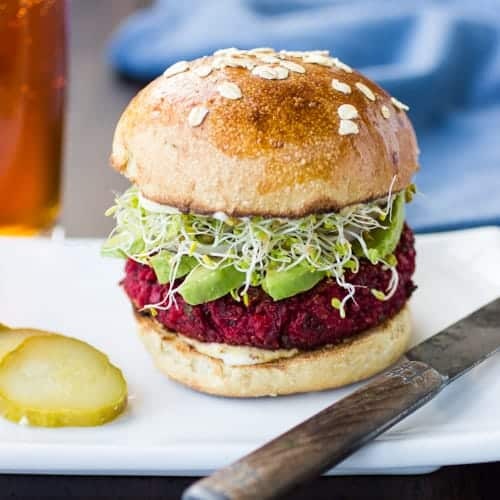 "I think that veggie burgers should stop trying to taste like beef, and that if you miss them that much, perhaps your body is begging you to indulge in a real (grass-fed, organic) burger for a good reason." I just find this so wonderful! 3. I just discovered the masala chai snickerdoodles you posted about last month and I almost cried with happiness. I'm going through a pre-prep lunch stage right now where I eat the same thing for several days. 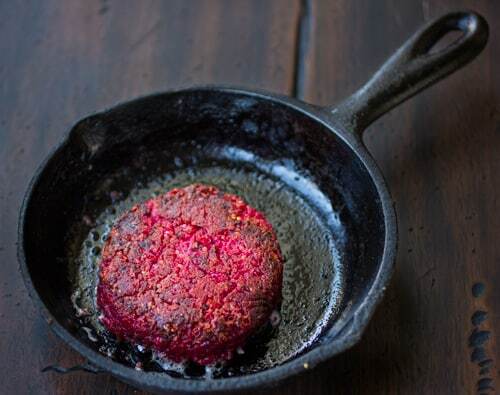 It really makes life easier and I think the beet burger is going to be a fantastic addition to my meal schedule! just made these and they were deliciouss!!! 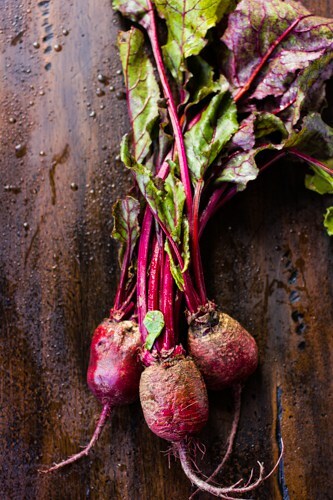 i usually hate beets, but these were great and added a lovely color. one thing i will say was that it was very hard for them to stick (maybe i added too many beets) so after my 1st batch, i had to add in an extra egg. Found you thru pinterest. Perfect timing for Valentine's Day! Yay! Hope your sweetie loves them. I just inhaled two patties over a bed of lettuce with a light balsamic vinaigrette. Thank you so much for sharing this recipe!! I just found your blog through pinterest, I'm so excited to try out more of your recipes. …and you're so right, veggie burgers shouldn't try to taste like meat!! Sorry the grating took so long (it IS rather tiring), but surely there are worse fates than too many veggie burgers? ;) So glad you like them. Ps. I like your orange tabby. 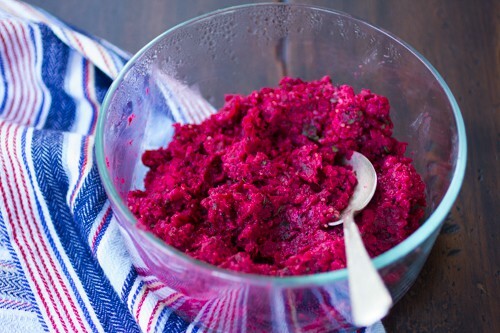 I put the beets in a food processor because I had make beet burgers that way before. These didn't hold together at all, even after sitting in the fridge in patties overnight. Not sure how others are sticking together! Unless this recipe relies on the shape of grated beets. Hi Sarah, I'm sorry to hear that these are not sticking together! You could try adding another egg and/or more oats? Mine held together enough to fry; they were on the delicate side in the bun, but I liked them that way. If you didn't weigh your beets, I'm wondering if they were larger than mine, which might explain the lack of holding-togetherness? I'm planning on making these tomorrow with beets I bought today at the farmers market, can't wait. 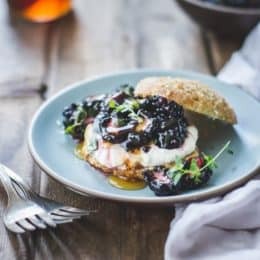 I don't usually eat eggs so there are rarely any in my fridge – is the egg optional in this recipe? or do you have a substitution suggestion? Wonderful even low these many years, I never had to use an egg and they hold together fine. However I make mini sliders which may explain their cohesion. Also I do toast the quinoa which gives a crunchier texture throughout. I boil the water down till it all steams away and add the same amount of water before burning the quinoa then cook as normal. I'm going to freeze some of them. Should I fry them in the pan ahead of time or just freeze them in the mixture? Hi Butterfly, I'm guessing that if you fry them first, that will flatten them out and make them easier to heat up a second time. Please let me know how it goes. there are no other words to describe these than AMAZING! so happy with how they turned out. i bought prepared beets from Trader Joe's and just patted them dry with a paper towel after i grated them. i noticed i had to add a little bit more oatmeal to the mixture so it would form better. definitely worth making again and the beet flavor wasn't overwhelming. well done! thanks for an amazing recipe. it's a keeper! Would these work just as well with golden beets? I've got them in the refrigerator and they need to be used! I don't see why not – I bet they'll be beautiful! Let me know how it goes! Thanks for giving the recipe a go – I'm really sorry your burgers are not holding together! A couple of commenters have had the same problem, while others report that they hold together just fine (as did mine when I made these earlier this year). The only factor that I can think of is that if your beets are larger than mine (and you didn't weigh them), they would produce more beet matter and perhaps cause the burgers to not hold together as well. (I'll add a note up top to weigh the beets.) That being said, one commenter who used more beet didn't seem to have a problem with this. Either way, I'm surprised that extra egg isn't helping them stick! I'll make these again soon and I'll report back. I might try adding still another egg and/or more quick oats. If that doesn't work, then I would stick the mixture in a pan and bake it in the oven for a sort of "beet loaf." 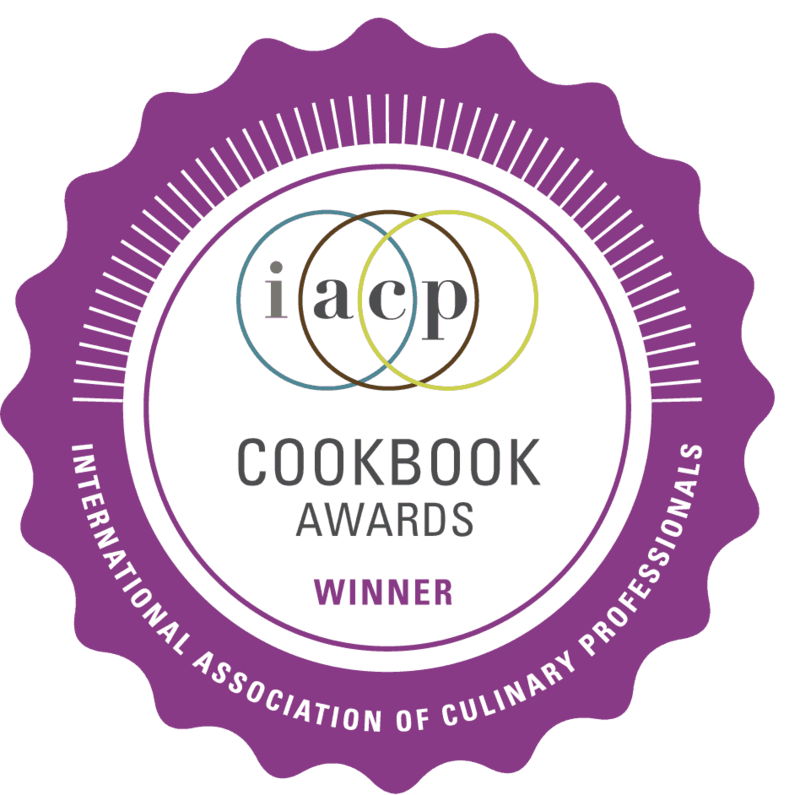 Thanks a lot for the feedback, and I'm really sorry that the recipe didn't work out for you – boo! Thanks! I decided to let them chill in the refrigerator overnight after adding more quick oats and I also added milled flaxseed. I plan on trying to cook them again, otherwise baking it in a pan sounds like a great idea! Oooh, flaxseed sounds like the perfect solution. Let me know how it goes. I'm crossing my fingers! 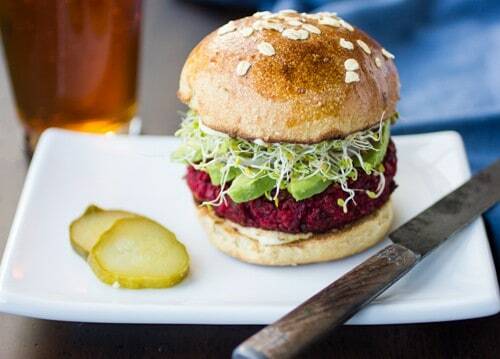 I know this is a years late comment, but this is by far the best Beet Burger ever. I had to veganize it so I used an egg replacer which seems to be a potato starch, I add just enough so the mixture remains moist and holds together when cooking. I also only cook then as sliders so the size may matter somewhat in preserving their fragile nature. 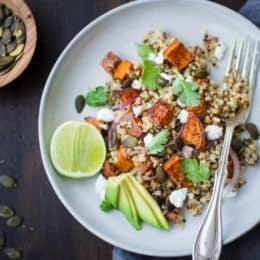 I also toast the quinoa by boiling out the water at high heat then add a cup of boiling water and remove from heat and allow to fully absorption– adds a great crunch. I top it off with a vegan curry mayonnaise to complete the flavor sensation. Whoa, that sounds amazing! Thank you so much for the note and for sharing your variations and tips. It's never too late! This recipe looks delicious and I’m so happy I got a chance to try it today! I am satisfied with how they turned out and my family enjoyed them as well! I added two of my favorite seasonings to the beets while cooking them, smoked paprika and cumin. It was heavenly. I saved half of the patties to try cooking them in the oven to see how that turns out. I’m going to prepare more tomorrow for a party. I plan to serve them as mini patties, without a bun, drizzled with avocado sauce and topped with alfalfa sprouts as hors d’oeuvres. Wow, so glad I stumbled upon your website! 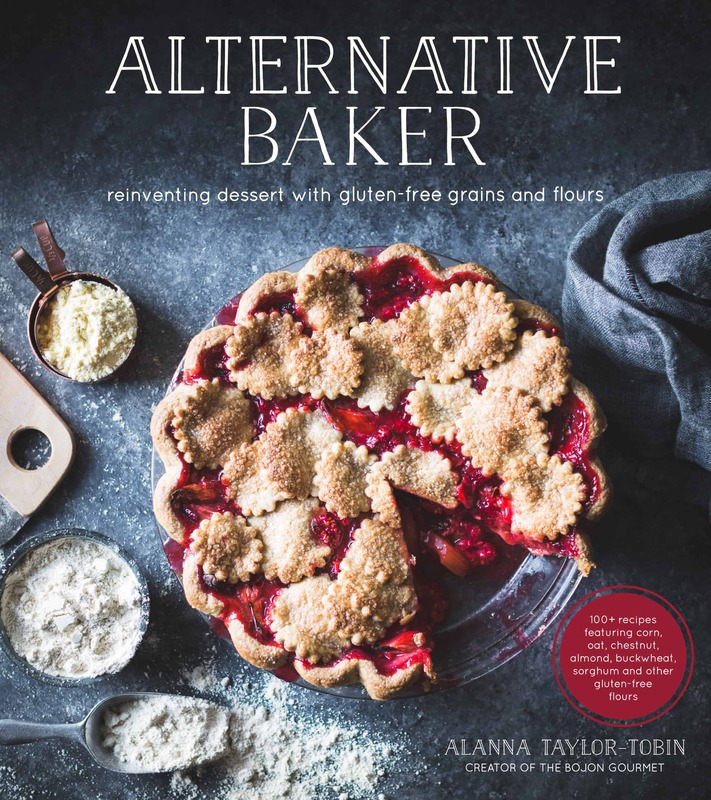 Some amazing looking recipes, can’t wait to try the burgers yum!! I cannot thank you enough for this recipe! EXACTLY what I was looking for. Making them today!